Does this blog thing still work? *poke* Hmmm. My friend Carl sent me foil-packed Japanese snacky delicacies from Narita and the QBB Smoked Cheese (or should I say “Smoked” “Cheese”) has apparently reignited my blogging fires. Or something. I also will not eat or microwave the “oxygen absorber” packet that I guess was helping keep the cheese “fresh” — it says “DO NOT EAT DO NOT MICROWAVE” and you don’t need to tell me stuff like that twice. The allcaps were unnecessary. 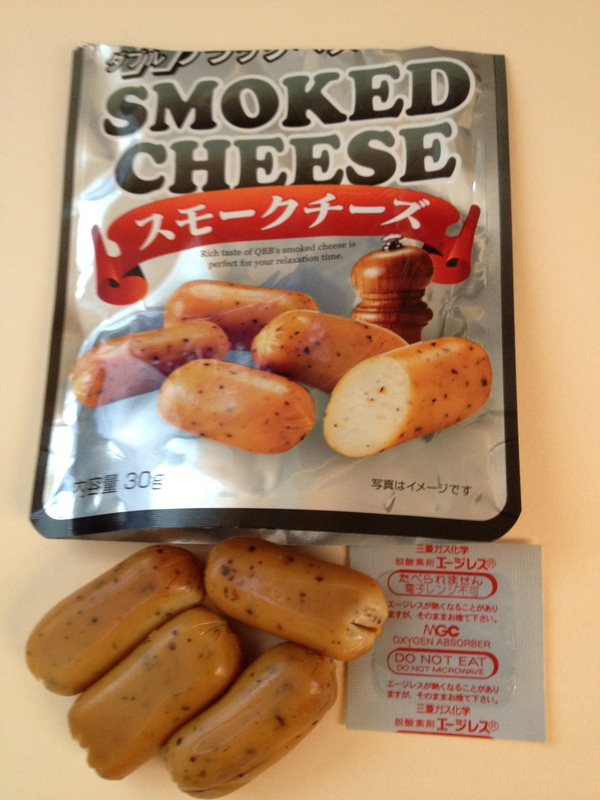 Several other QBB “cheese” products are reviewed on the Japanese Snack Reviews blog. I’ll see what H Mart’s QBB selection is next time I’m there (surely soon). I wonder* if the soon-to-open Wheaton Safeway (!!!) will carry OBB products? Not yet a reality, but it could happen. The Gloucestershire cheese chase has been cancelled for the first time in centuries due to overpopularity. The chase is inherently unsafe to begin with, and too many spectators makes it worse. But I think this would be a fine cultural and culinary event for Wheaton to pick up the slack. We could roll three rounds of Double Gloucester in the Metro, one per escalator; for extra challenge the escalators could be running up. Or we could stage the roll down Reedie, starting at Georgia and ending at Viers Mill. Traffic could be temporarily diverted or not, depending on one’s goals for the event.